ICG is expanding its product line to include the encapsulation of altered and counterfeit coins to be used for educational purposes only. We feel it’s an idea whose time has come due to an increased number of requests from collectors and numismatic educators. F. Michael Fazzari, an authenticator and grader at ICG, recounts several occasions where a particularly useful counterfeit specimen has become worn or damaged in a seminar due to an accident or careless handling. Our new ICG Educational Slab for Altered and Counterfeit Coins will prevent this from happening in the future, while ensuring collectors and dealers are not fooled into thinking a coin is authentic because of the slab. An attractive yellow label has been designed incorporating the word “fake” in four languages subdued into the background. 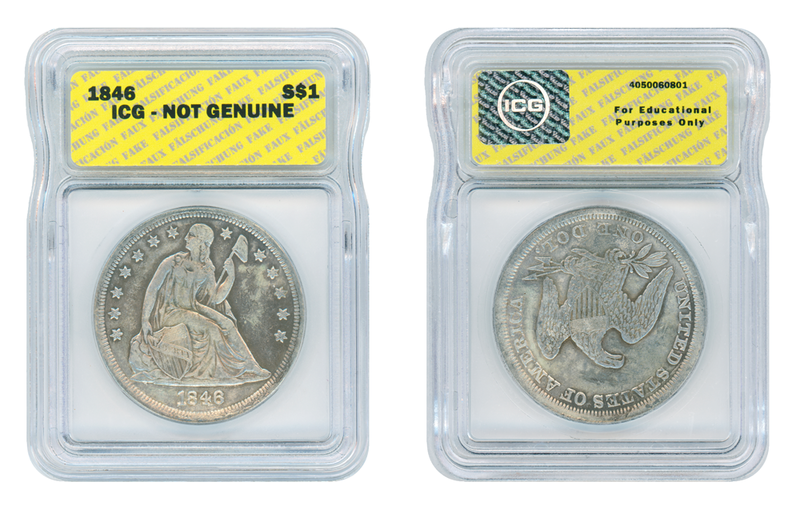 The coin’s serial number is on the label’s reverse along with the admonition: “For Educational Purposes Only.” During a test period starting in January, ICG has slabbed nearly a hundred coins for display and for customer’s educational needs. This service is now available for everyone upon request. Customers wishing any coins in their submission that ICG determines to be counterfeits be encapsulated rather than returned “raw” will need to write “Use Educational Slab If Non-Genuine” on the submission form and will be charged at the selected tier price plus an additional $7 for each coin slabbed in this new holder.